The original MedLite laser(Conbio, USA) is the photoacoustic technology using high peak power and nanosecond pulse duration to target chromophores with a photomechanical action. It is the gold standard for removing skin pigments, tatoos, birthmarks, skin toning and skin rejuvenation as well as minimizing the pores. This pioneer Q-Switched Nd:YAG gave dermatologists the ability to treat a wide range of aesthetic indications safely and effectively, with no or slightly downtime or patient discomfort. Medlite C6 is delivered through a superior flat-top beam profile - a hallmark of the MedLite laser - without spikes or hot spots that are prevalent in other Q-Switched Nd: YAG lasers so complications from the laser is unusual. Today, the MedLite laser is the workhorse of many aesthetic practices worldwide. A MedLite C6 laser is a safe, premium-engineered, aesthetic laser designed for versatility and effectiveness in a wide variety of applications. ConBio has made continual improvements to the MedLite laser since its introduction in 1992, increasing its power output, reducing its size, and introducing valuable features to maintain high levels of physician and patient satisfaction. Today, the MedLite C6 is best known for its PhotoAcoustic effect, a combination of high power and nanosecond pulse widths that deliver peak energy throughout the layers of the epidermis faster than the normal relaxation time of the tissue. The result is a safe, effective way to harness peak power. ConBio was the first company in the aesthetic laser market to create a truly homogenous flat-top beam profile for a Q-Switched Nd:YAG laser. The secret is in high-quality components – a carefully selected array of superior elements simply not found with inferior Q-Switched Nd:YAG lasers that try to copy our technology. The MedLite C6 beam is smooth and evenly calibrated, without "hot spots" or uneven spikes of energy typical in other lasers. As a result, the energy is delivered evenly from the perimeter to the center of the beam with no vacuoles or dead areas. This homogenous profile allows more efficient delivery of the energy – and more pronounced tissue reaction under the dermis to better fragment the target chromophores. The ultimate proof of a genuine flat-top beam profile is in the tissue reaction –consistent results, less complications and no patient downtime. Standard Gaussian beam profiles of other lasers tend to scatter on the skin's surface requiring more shots to fragment the target chromophores causing unnecessary damage to the epidermis. The MedLite C6 delivers long-term, consistent flat-top capability, even after the laser is operated for long periods of time. The stabilized and consistent temperature of our lasers optimizes the output of the homogeneous beam. 1. 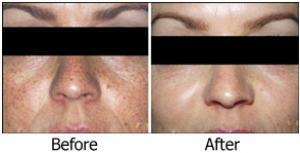 What types of pigment spots will Medlite C6 remove? Sun spots, freckles, photodamaged spots, some pigmented birthmarks, multicolored tattoos are common indications for Medlite C6 laser. 2. How many sessions will it take to get rid of these pigments? The treatment sessions depend on the types of pigments. Please call us 087-3006677 for a consultation! 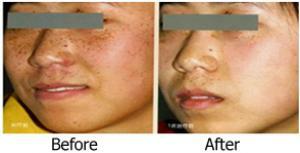 Mostly, some freckles and sun spot may disappear in one session. 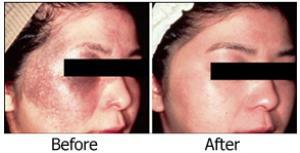 Medlite C6 laser provides non ablative mode which has no any downtime. 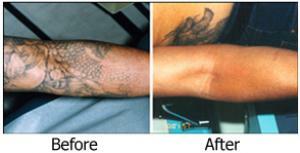 However, there will be minimal pinpoint bleeding or blisters for deep pigments or tattoo removal. 4. What are the side effects of the treatment? In most of the cases, Medlite C6 laser provides significant improving results without serious complications. In addition, our doctor has almost 10 years experience performing the laser. However, post inflammatory hyperpigmentation (darkening of the skin after the laser treatment) or hypopigmentation (lightening skin after the laser treatment) can occur temporary.